These house numbers are made by Porteous Tile company. Tiles measure 3x6 and can be purchased individually or framed. We use a special exterior finish on the frames that is moisture and sun resistant. For your house number we have the green tile as shown, and we also have a dark red tile with white numbers, and a deep brown tile with tan numbers. Specify your house number and color choice in the special dialogue box. Priced as shown framed, with four numbers. LIMITED - PLEASE CALL FOR AVAILABILITY. New from our friends at Motawi Tileworks! This previously retired design is now available in a 4 x 4 size. This historical tile design is inspired by the Alhambra Castle in Spain. Available in 3 colorways. New from out friends at Motawi Tileworks! These beautiful tiles look elegant in our own handmade quartersawn white oak "Oak Park" style 2 inch wide mitered frame molding - hand selected to ensure the best finish. Also available framed in our 3" wide "Legacy" molding, formed with a slight bevel to draw attention to the tile, or available unframed. NOW FROM DARD HUNTER STUDIOS: Select one of 3 color choices for our hand applied finish at no additional charge! These house numbers are made by Porteous Tile company. The number tiles measure 3x6 and can be purchased individually or framed. We use a special exterior finish on the frames that is moisture and sun resistant. For your house number we have the green tile as shown, and we also have a dark red tile with white numbers, and a deep brown tile with tan numbers. You may then choose any of our 100+ available porteous tiles as your decorative accents. Specify your house number, color choice, and which 6x6 tiles you want in the special dialogue box. Priced as shown framed, two 6x6 tiles and two numbered tiles. LIMITED - PLEASE CALL FOR AVAILABILITY. New from our friends at Motawi Tileworks! 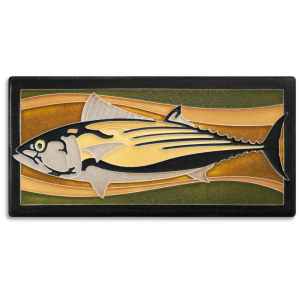 A collection of tile designs based on the work of beloved wildlife artist, Charley Harper (1922-2007). These whimsical tiles look elegant in our own handmade quartersawn white oak "Oak Park" style 2 inch wide mitered frame molding - hand selected to ensure the best finish (pictured here in our popular Ebony finish). Also available framed in our 3" wide "Legacy" molding, formed with a slight bevel to draw attention to the tile, or available unframed. NOW FROM DARD HUNTER STUDIOS: Select one of 2 color choices for our hand applied finish at no additional charge! Both look fantastic with the Charley Harper tiles by Motawi Tileworks! New from our friends at Motawi Tileworks! The man in the red suit adds that spark of holiday magic we all know and love this time of year. 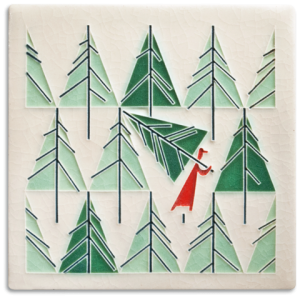 It's the perfect tile to deck the halls. 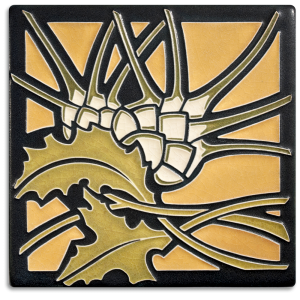 Part of a collection of tile designs based on the work of beloved wildlife artist, Charley Harper (1922-2007). These whimsical tiles look elegant in our own handmade quartersawn white oak "Oak Park" style 2 inch wide mitered frame molding - hand selected to ensure the best finish (pictured here in our popular Ebony finish). Also available framed in our 3" wide "Legacy" molding, formed with a slight bevel to draw attention to the tile, or available unframed. Select one of 2 color choices for our hand applied finish at no additional charge! Both look fantastic with the Charley Harper tiles by Motawi Tileworks! New from our friends at Motawi Tileworks! 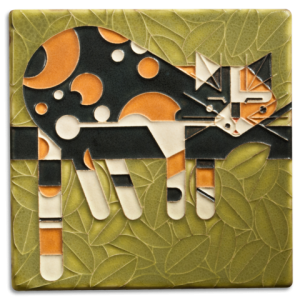 A collection of tile designs based on the work of beloved wildlife artist, Charley Harper (1922-2007). Homecoming is from the Harper lithograph of the same name. These whimsical tiles look elegant in our own handmade quartersawn white oak "Oak Park" style 2 inch wide mitered frame molding - hand selected to ensure the best finish. Also available framed in our 3" wide "Legacy" molding, formed with a slight bevel to draw attention to the tile, or available unframed. NOW FROM DARD HUNTER STUDIOS: Select one of 3 color choices for our hand applied finish at no additional charge! Both look fantastic with the Charley Harper tiles by Motawi Tileworks! 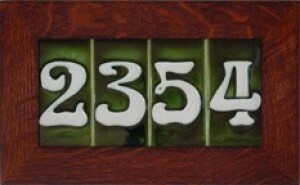 These unique tile house numbers are made by Porteous Tile company. The number tiles measure 3x6 and can be purchased individually. We also have a dark red tile with white numbers, and a deep brown tile with tan numbers. Please specify your desired numbers and color selection in the special dialogue box. LIMITED - PLEASE CALL FOR AVAILABILITY. 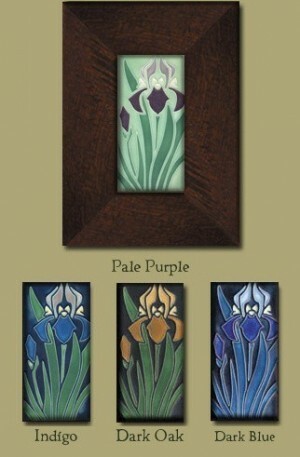 These stunning Iris tiles are available in several colorway choices. These 4 x 8" tiles are by Motawi Tileworks and are individually framed in our own handmade quartersawn white oak frames, hand selected to ensure the best finish, with a slight bevel to the molding to draw attention to the tile. *Please note: Motawi Tileworks charges us a surcharge for special order colors, which we must pass on as noted on the drop-down list. While we strive to keep a good selection of all the colors, if you need a special order color quickly please call us and we will be happy to check our inventory for availability.